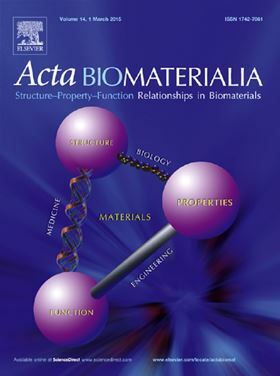 From now on, when you submit an manuscript to Acta Biomaterialia, we request that you include a short statement of significance. This statement should be written to a broad audience, at an undergraduate level, and limited to 120 words. These statements will address the novelty aspect and the significance of the work with respect to the existing literature and more generally to the society. They will be made available to all alongside the abstract on Sciencedirect, and reported on the journal home page. Viscous aqueous pastes of calcium phosphate particles (CaP) are increasingly used to repair bone defects. Despite their success related to their ability to fill any form and to be injected using minimally invasive techniques, CaP pastes have drawbacks such as a limited injectability (syringe plugging) and sub-optimal biological properties. Various studies have shown that the biological performance of such pastes can be improved by adding degradable microbeads acting as a porogenic agent and/or drug reservoir. Unfortunately, such beads are likely to interfere negatively with the paste injectability. The present study provides quantitative data relating injectability and bead volume fraction of bead-loaded CaP pastes. As such, it helps the design of injectable microbead or microcapsule-loaded CaP pastes.